The South Seas hideaway is closing soon at the Disneyland Hotel and will reopen in 2019 as Tangaroa Terrace Bar & Grill. The location’s ’50 Tiki-inspired design will remain after the refurb, and continue to complement the mid-century modern architecture of the Disneyland Hotel. Guests will get to enjoy a new outdoor bar and refreshed patio, which all serve island cocktails and Asian-inspired eats. New details will be added to the interior of the restaurant, including light fixtures made of fishing floats and netting, a tropical mural and bamboo accents. A new service window dedicated to coffee selections in the morning and Dole Whip throughout the day will also be added, perfect for a treat by the pool. The bar & grill will offer breakfast, lunch and dinner options, with an open-air marketplace for something quick to eat. While Tangaroa Terrace undergoes these changes, its menu offerings will be found at The Coffee House, Trader Sam’s Enchanted Tiki Bar and Steakhouse 55. This dining location will also be closing soon, and reopen later this year with a brand new look. While guests wait for this change, Hearthstone Lounge will offer grab-and-go food and beverage options. 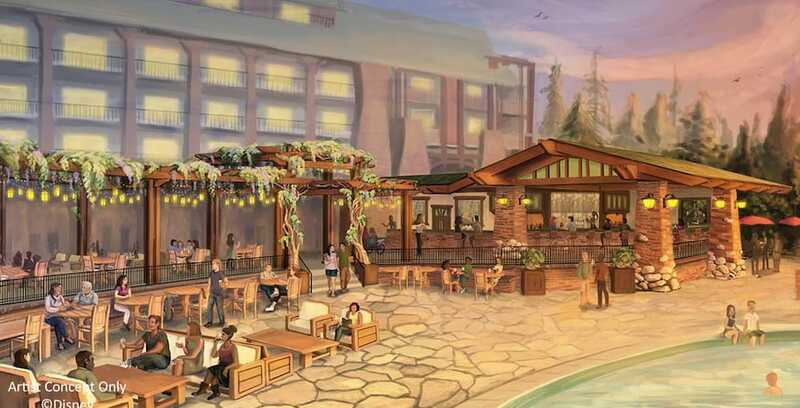 Guests of Disney’s Grand Californian will also get a new luxury lounge location, with a new pool bar opening in spring 2019. As shown in the artwork above, this new area will carry the hotel’s Arts and Crafts design, and feature a custom tile mural at the back bar. New lounge and table seating will also be available at this new bar area. Stay tuned to our website, Twitter, Facebook, Instagram, and YouTube channel for more updates! To learn more about other dining offerings at the Disneyland Resort, visit Disneyland.com.